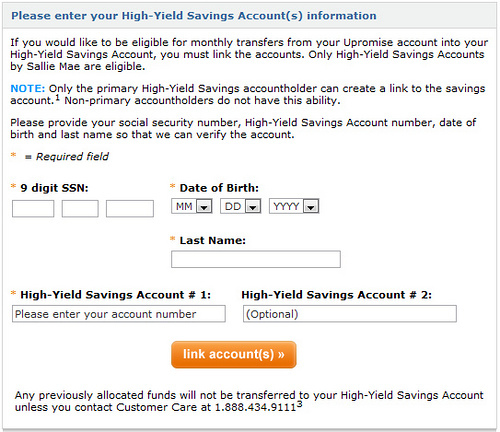 I opened a Sallie Mae Savings Account last May. 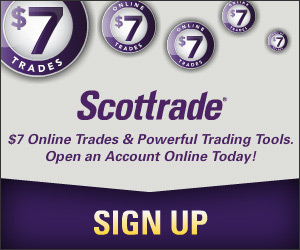 The reasons for getting another account when I already have a few in the dormant mode were 1) the rate was better than all others and 2) I like the Sallie Mae’s feature that allows me to earn extra return from Upromise, which is also owned by Sallie Mae. Unfortunately, even with all the nice features, I waited more than 8 months after opening the account to actually link my Sallie Mae Savings Account to Upromise account. I just forgot to do it, despite that it is a simple process that only took a few minutes to complete. If you also have a Upromise account, here’s how you can link Sallie Mae High-Yield Savings Account to Upromise and earn 10% match of your Upromise earnings. 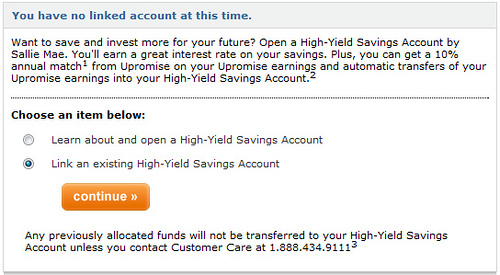 First, after logging into your Upromise account, click the High-Yield Savings Account link under My Earnings Usage on the left side. From there, you can choose whether to link to an existing account, if you already have one, or open a new Sallie Mae Account if you don’t have one but are interested (see how to open a Sallie Mae Account for details). Since I already have an account, I used the second selection. Next is to actually link the account. To do that, you need to provide information about your Sallie Mae Account (account number) and your personal information (name, SSN and DOB). Once you are done, submit the information and link the account. The last step of the process is to allocate earnings between Upromise College Fund and Savings Account. I have been using Upromise credit card (first from Citibank, then from Bank of America) to shop and earn cashback since 2002. 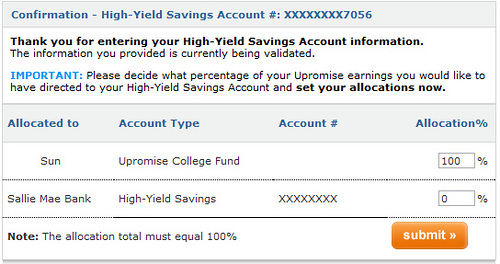 Until now, all the rebates I earned were invested in Upromise College Fund that I set up to save for my daughter. At the final step, you can allocate how much you want to go to the college fund and how much to the savings account. Submit the information and that’s it. Excellent items from you, man. I’ve be aware your stuff prior to and you’re just too wonderful. I actually like what you have received right here, really like what you’re stating and the way in which wherein you are saying it. You’re making it entertaining and you continue to care for to keep it wise. I can’t wait to read far more from you. That is really a terrific web site.